Kashmir valley, often reffered to as ‘Paradise on Earth’ is a famous tourist destination. The switzerland of India Kashmir is flooded with snow in winter and flowers in spring. Kashmir has no lack of pretty villages loaded with wooden houses with vivid rooftops all the way. Popular tourist destination of Kashmir includes Srinagar, Pahalgam, Gulmarg and Soanmarg. These places are flooded by tourist all around the year. The famous Amarnath cave dedicated to Lord Shiva is located in this region. The world famous Pashmina shawls are woven in Kashmir region. Also, Kashmir is considered one of the three prominent cultivating places of saffron all over the world. Tourist from all over the world visit this place to enjoys it’s beauty. What to visit in Kashmir? 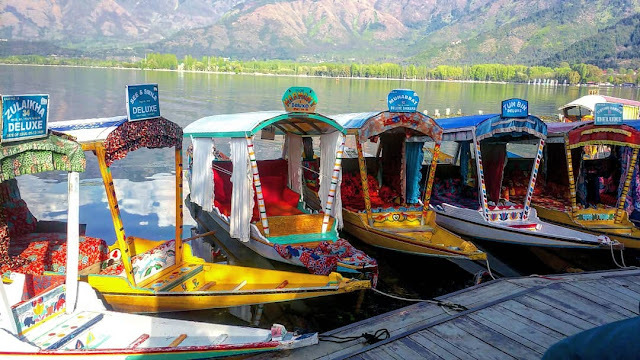 Spread over 15km around, Dal Lake is Srinagar’s jewel and one of the prime tourist attractions in Kashmir. It is known for its sparkling water and the ride on thin canopied boats called Shikaras. The constant floating hotels or accommodations namely the Houseboats are yet another attraction of the lake. Scenic views of the lake can be witnessed from the shore line Mughal gardens, such as Shalimar Bagh and Nishat Bagh built during the reign of Mughal Emperor Jahangir. 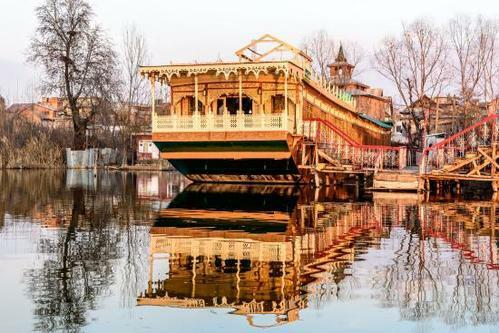 Also known as “the garden of bliss”, Nishat Garden in Srinagar is set on the banks of the beautiful Dal Lake. The garden is set at the backdrop of the snow capped Pir Panjal mountain range and it offers a great sunset view of the Dal Lake. A beautiful water channel flows right in the middle of the garden. Nishat Bagh was designed by Asaf Khan, the brother of Nur Jahan back in 1633 AD. The garden has 12 terraces, one for every zodiac sign and they keep on rising up the mountain side. All the terraces are filled with different colored roses, lilies, geraniums and asters. The terraced Chashmashahi Gardens (9 kms from Srinagar) was built by Ali Mardan Khan, the governor of Kashmir, during the reign of Emperor Shah Jahan.A mountain spring, with medicinal values, feeds the various fountains and It is built around a fresh water spring, discovered by Rupa Bhawani, which flows through its centre in terraces Hence the name Chashmashahi. The name is quite familiar it is a heli base for Amarnath Yatra or a beautiful link connecting Srinagar and Kargil I say it’s a destination worth stay. Located about 90 km to the north east of Srinagar, Sonamarg is being visited for many reasons. It is registered on the minds of tourists and tour operators as a connecting link between Srinagar and Kargil. For those who are determined to take a road way to Leh, Sonamarg is a must-visit stop, rather an unavoidable pass. The desire to spend nights in Sonamarg pops up immediately after you step into the land of beauty and magic. Its vast meadows truly mesmerize you and the glaciers consistently speak to you. One must also note that Sonamarg is base camp for some great Kashmir treks, including the most popular Great Lakes Trek. Besides trekking the other adventure activities that are conducted here are River Rafting and Rock Climbing. Gulmarg is a crown of Kashmir as said by the locals of Jammu and Kashmir is also stand by its name Meadows of Flower. The place present a complete bloom-showers in the summer season with beautiful flowers like daisies and bluebells. Gulmarg forms the most popular or the golden triangle of tourism in Kashmir. The place is well-known for having the world’s highest and Asia’s longest cable car project which is called Gulmarg Gandola. What makes you visit Gulmarg? *This ski resort is the perfect summer holidays destination and is just 46 kms from Srinagar. * Gulmarg provides the best Himalayan view which you really can’t afford to miss. * Trek lovers? Gulmarg is a popular trekking base. *Gulmarg has exactly what a nature lover’s needs. The Gulmarg Biosphere Reserve is known for birds watching. *The place has the highest altitude golf course which is a true treat for the golfers. Pahalgam is located about 95 km away from Srinagar. It is one of the best hill station of Kashmir. It is also known as “The Valley of Shepherds” and it is a base camp for Amarnath Yatra. The place is not only known as pilgrimage site but also holds snow festival where winter sports are show cased. Tulian Lake is 15 Km away from Pahalgam and it is a beautiful lake in the middle of mountains. You can trek or hire horses to visit this lake and witness pure bliss. Betaab Valley is situated about 15 km away from Pahalgam and falls enroute to the Amarnath temple yatra. It is named after the movie ‘Betaab’ which had actors Sunny Deol and Amrita Singh. The Betaab Valley is popular amongst trekkers as it serves as a base camp for numerous treks that go further into the mountains. Chandanwari is known for its snow bridges and it is also the starting point of the Amarnath Yatra. One can reach the place by hiring a car. If you are visiting during the winters, don’t forget to hire some boots and coats and enjoy the beautiful sight around and play in the snow. Aru Valley is most beautiful valley in Pahalgam, visiting Aru is getting to see local culture and traditional way of living first hand. Tourists can shop for souvenirs that are a lot more indigenous and admire the way local houses are made.